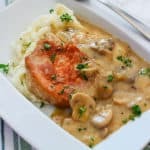 This Instant Pot Pork Chops recipe just may become your favourite pork chop recipe altogether. With a seared outside and a tender middle, the meat is smothered in a delicious mushroom gravy. Ideal for busy nights when we're short on time but still want a homemade dinner that's quick and easy. Season the chops and place them in the pot with some oil or butter. Sauté the chops until some colour is developed on both sides of the meat, approx. 2 minutes. Remove chops and set aside. Add the soup and the water. Whisk until the soup is well broken up and mixed with the water. Don’t worry too much if the soup hasn’t completely dissolved into the liquid, as this will happen when it cooks. Fasten the lid, set the toggle switch to seal, and cook on manual for 7 minutes. When cooking time is complete, allow for a 12 minute natural release. After the time is up, move the switch to venting, and release the rest of the pressure in the pot. Remove the lid and stir. Remove the chops and mix up the cornstarch into a few tbsp. of water and add. Stir until thickened.